Sign up to twitter following persuasion/pestering by colleagues. Follow Stephen Fry, a famous sportsman/popstar and a news channel. Read a few tweets, don’t understand what the fuss is about and mock anyone who uses twitter. Overhear colleagues chatting about twitter and a great article they found. Promise to give it a go again and follow two or three recommendations. Find articles interesting and wonder how to get more. Nervously ask colleagues for help/who to follow and start to visit timeline a couple of times a week. Think about posting first tweet. In an act of tremendous bravery write: ‘My first tweet, wondering what this twitter thing is all about?’ Sit waiting for a response – feel unloved. Upon realising you have no followers ask colleagues how to get them? Watch ‘how to’ video on youtube and receive follows from a few educators – strangely Stephen Fry remains uninterested. Have a mini twitter conversation with colleague, even retweet a couple of statements. Forget the @name and wonder why they don’t reply to your last question. Back to ‘how to’ video and sob quietly when the word hashtag is mentioned. Practise a couple of tweets that include @names and hashtags. Compare with other tweets on timeline and finally send. Remember to click on hashtag to see other comments. Feel proud that you chose the #edchat timeline and impressed with the amount of followers some people have – decide to follow them. Retweet any link you find interesting as people might read them. Begin to interact with ‘tweeps’ you have never met and who seem keen to help you. Discover they are prepared to share resources that may be of interest and tell them how great they are. Begin to tweet articles you find on the internet or in Zite magazine. Enjoy the responses. Comment how lovely people are. Followback anyone that follows. Actively search for new people to follow (partly so they will return the favour). Thank colleagues for introducing you to twitter, impressed with the knowledge you have gleaned and your growing number of followers. Spread the word amongst friends and fellow educators. React badly when partner points out a mild addiction and a crick in your neck. Tweet how ridiculous it is that people aren’t on twitter. Join in weekly twitter chats using education hashtags. Reflect that twitter is an incredibly positive place and everyone is full of praise. Realise there is a need to filter information and make own judgements. Start a blog to better communicate ideas and tweet to garner opinion. Understand that the more you interact with followers the more honest the feedback. Direct message to your heart’s content. Feel pleased you have developed a Personal Learning Network (PLN). 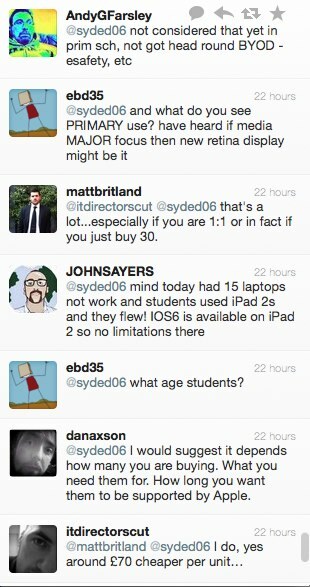 Use the phrase ‘twitter is the best staffroom/cpd in the world’ on numerous occasions. When seeking opinion from a range of people, ask PLN to respond. Begin a twitter chat that not only informs but provokes fresh debate and develops your idea. Wonder what you ever did before twitter? This graphic illustrates the variety of comment and the reason twitter is an outstanding tool for educators everywhere. A number of different opinions were offered and that allowed for a more informed debate to be had in school the next day. We would not have considered many factors if the twitter chat had been missing from the process. How else would we connect with so many experienced professionals in such a short period of time? 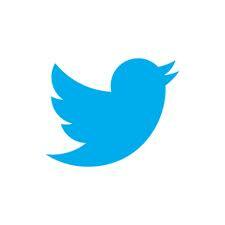 Twitter is a fantastic resource for educators around the world and I am indebted to past, present and future folk willing to contribute, inform and debate. The common goal is to enhance learning for our students and educators on twitter are so pro-active it makes you proud to be amongst them (sobbing starts again). I look forward to the next 10 stages. Thanks for the post… S true. Am currently at step 8 or 9 myself with hubby and son laughing at my addiction last night and my first blog post germinating…will share this post with these I’m trying to ‘convert’! Thanks Denise. I know twitter will keep on giving . . . . good luck with the non-believers. Hilarious and so accurate, from stage 1 to 10! I shared this on facebook but how can I share to google+? Must share! And also I have come up with a new slogan: Consitter twitter! Very good. I like the new phrase. Not sure about google + though. I loved this! Thank you. I saw myself in every stage, I even followed old Fry! This is great! I am still laughing because I went through every stage!! Thanks David. It seems we followed very similar paths! Reblogged this on Social Media CDN. Pingback: Should teachers use Twitter? I feel like a total twitter newbie. After reading your post, I would say I’m a stage 7. I also wish I could have added to that twitter chat. I wonder if anyone ever brought up the dictation feature that is not on iPad 2 but is on iPad 3. Thanks for the great read. I have so much to learn and I’m finding it here on Twitter. Thank you Karen. You certainly seem to have got the hang of twitter. A funny and interesting post. Have been stuck around stage 4/5 for ages. Can see the benefits of reaching stage 10. Have been following posts for along time but still trying to find my Twitter voice. Will keep on trying! Having just helped to introduce a number of our faculty to Twitter and it’s educational uses, this post sums up the beginnings of twitter use for teachers quite nicely. I think this is pretty spot-on.